Last week I was out in da bush near Outapi at the Omufitu North Combined School doing some training for the teachers. Emily is a Peace Corps volunteer at the school and managed to get a suite of 6 new computers donated for their library. In a foolish moment there was an offer of some training so John (fellow Opuwo IT bod) found ourselves committed. We met up with Emily in Outapi and then had to pick up one of the school teachers to act as guide because thanks to recent heavy rains the usual route (which we got lost on before anyway) was now underwater. Even the “dry” route was pretty wet but the Mighty Condor churned through. At a few of the larger lakes our guide had to think about whether people had put bricks (for traction) in the water. Bricks mean you go very slow. No bricks mean you go fast. Going at medium speed would jar stuff loose if there are bricks and get you stuck if there aren’t. Luckily she remembered right and we reached Emily’s home with some quality off-road chic mud splatters. Emily lives with a family in a homestead a little way from the school. She lives the Peace Corps dream in a hut with chickens scratching around (or rather crapping around). Her host family had agreed to accommodate us for the week and I got my very own corrugated iron shack. Sweet. On Monday we got in early for assembly where we were welcomed and then got to look at the new PCs. We trained up three groups (grouped by previous experience) with each group doing one and a half hours a day for give days. All in all considering the pretty poor state of the training staff it went very well. The “beginner” group we got through Word, typing tutors and educational software while the “advanced” group got deep into Excel (not VBA deep but some sweet graphs and formulas). Topics included: computer rules, word, tux typing, tux math, powerpoint, excel, internet and email. On Friday we scraped the chicken poo off us as best we could, forded our way back out onto the main road and back to Opuwo. A gadzillion years ago during my first week in Namibia still undergoing training in Windhoek I bought a variable AC-DC power supply from the Tre Supermarket on a whim (and in the hopes my radio would pick up the World Service and I could power it from the mains, it didn’t and I couldn’t). This was a shiny white box with all sorts of different outlet connectors and quite decent. 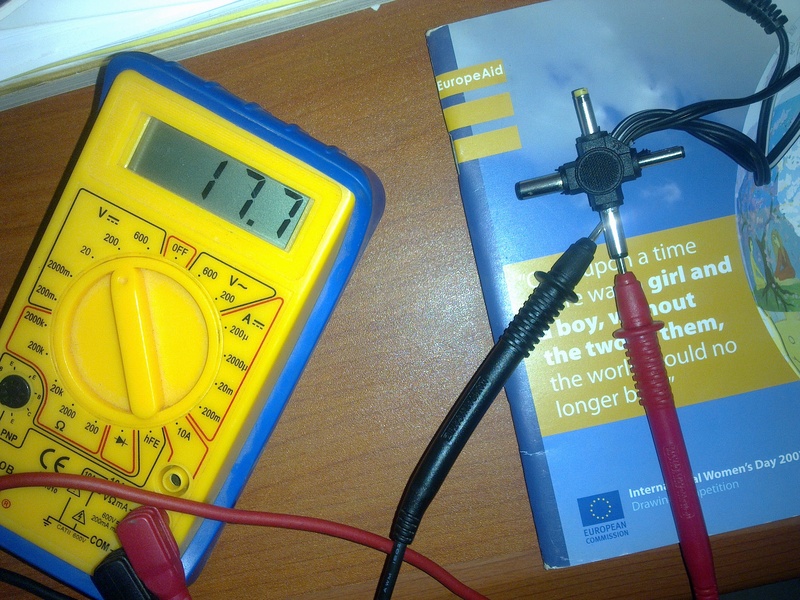 It did 3-12VDC at around +3% (12.4V for the 12V setting). When my mate John’s switch supply blew at the Ministry of Youth I foolishly lent him my shiny supply. A while later he blew it up. Causing some impressive scorching on the inside. Luckily I had just been gifted another variable supply so failing to learn my lesson and with the youth of Opuwo facebookless I lent him another. 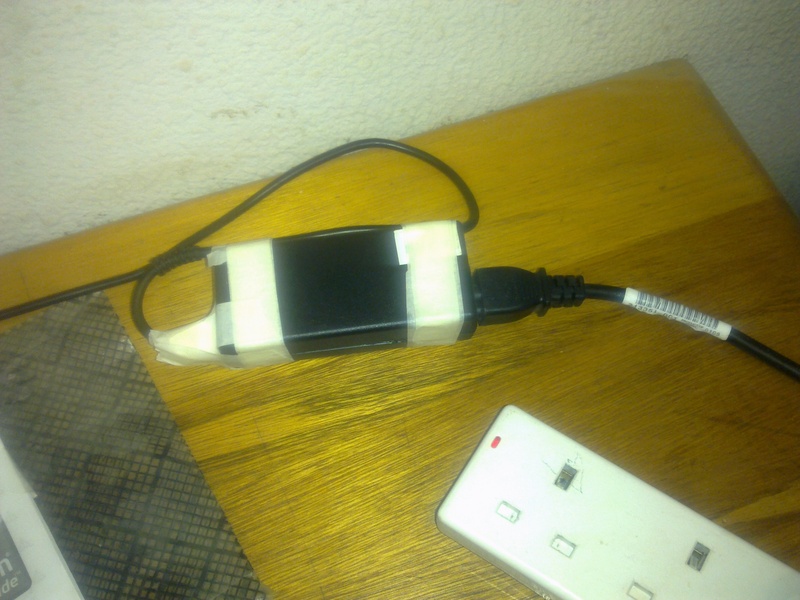 As I was now entirely out of supplies and nobody fancied my suggestion of jury-rigging the 12V bus of a hot-wired PC power supply he bought a replacement for himself and one for me. Did I mention my original one was quality and gave accurate output? Today I had potential need for another supply (see below) so took it out of the box and before blindly plugging it into anything tested the output and polarity. The polarity was correct to the setting but the output was a little off. Here it is on the 12V setting giving 17.7V. Nice. You don’t just get what you pay for – you get more! Probably too much more. To be fair though on the 9V setting it gives around 11.8V which should be good enough for 12V equipment. The reason I dug out the supply was because the Red Cross ADSL router wasn’t working, no lights showing (technical term is knacked). With the recent thunderstorms and spate of PSUs I’ve been replacing recently I thought it was probably just the transformer and planned to use Mr Overvolt as a temporary replacement. Testing their power supply against VDC caused a brief display and then nothing leading me to conclude it was the supply. But wait, what’s that on the bottom of the router for the input supply? 12VAC. AC? Surely not, a misprint of course. Check the power supply that has been working with the router until now and, um, it’s an AC-AC transformer (230VAC to 12VAC). Put the multimeter on the right setting and the power supply is fine, 15VAC (looks like they’re all at it) but steady AC nonetheless. So this means the router itself is creamed. But on the plus side I got to see my first ever (and hopefully last ever) low-voltage AC supply. Really? What’s that all about? I get the benefit of AC for transmission and for high-voltage or high-load appliances but at 12V and 1A? Also there is no way whatsoever all the components in the router (if any) use AC so I’d guess the very first thing inside is a bridge rectifier. Are Huawei just having a laugh? Found a very cheap supplier of the rare AC-AC transformers? Hate people being able to replace power supplies easily when they blow? Curiously my Huawei router (HomeLife a.k.a. 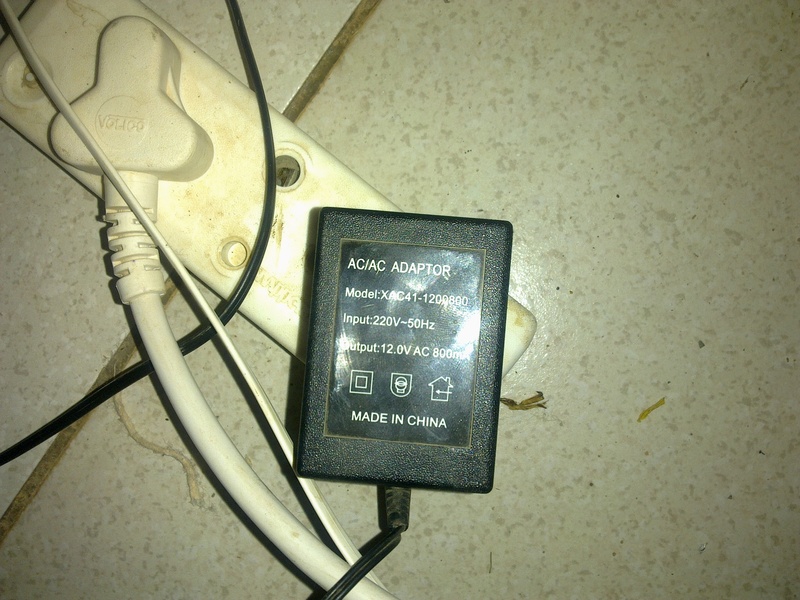 HG520b) is DC as is the work Huawei MT-330. Madness. It’s amazing what we sometimes get in the Opuwo Ok supermarket. Most of the time the amazement is limited to the amount of rotten veg and dubious canned goods but sometimes we hit gold. 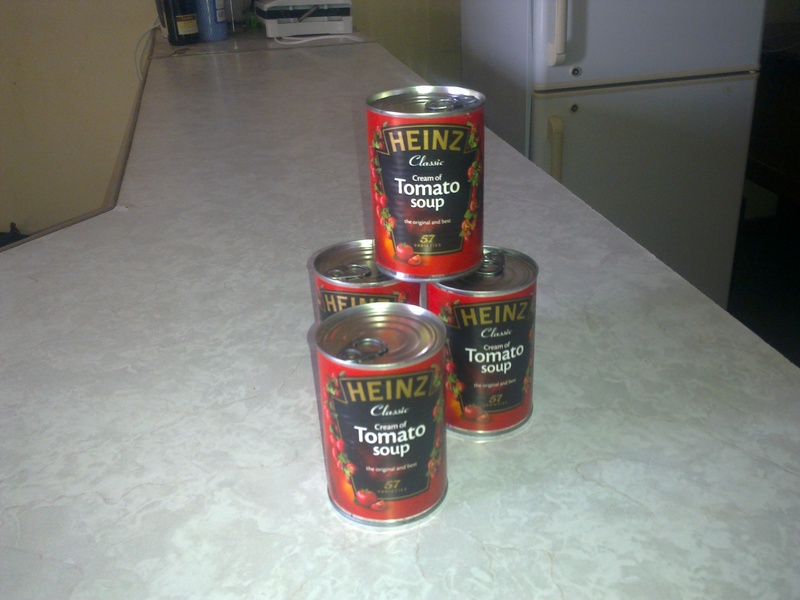 Imagine my surprise poking around the shelves to find actual genuine Heinz Cream of Tomato Soup. I quickly acted to corner the Opuwo market in Tomato goodness. Gaffer tape (Duct tape to our colonial brethren) is wonderful stuff. As are staples, paperclips and PVC tape. But so is masking tape. Recently my HP power supply started making odd sparking noises and (more importantly) stopped providing power to my laptop. As the next week my variable laptop supply started getting iffy on 19V (ok of course on all the other voltages) I had to hack my HP supply apart. It turns out that two years of hard Opuwo living had pulled the output wires out of their sheath and into contact with each other. Judicious cutting of plastic, popping of catches and forcing open of glued bits followed by generous application of masking tape and voila a fully functional supply. Sort of. Don’t pull on anything too hard. If it starts to smoke then run. On deploying to an emergency callout for the Tuberculosis Programme monitoring PC monitor in the Primary Health Care (PHC) clinic Center for Communicable Diseases (CDC) [phew] I found that someone had managed to punch in the power button for their 17″ HP Cathode Ray Tube (CRT – not flat screen) monitor. IT monkeys like me approach CRT repairs with a little trepidation and a current will. 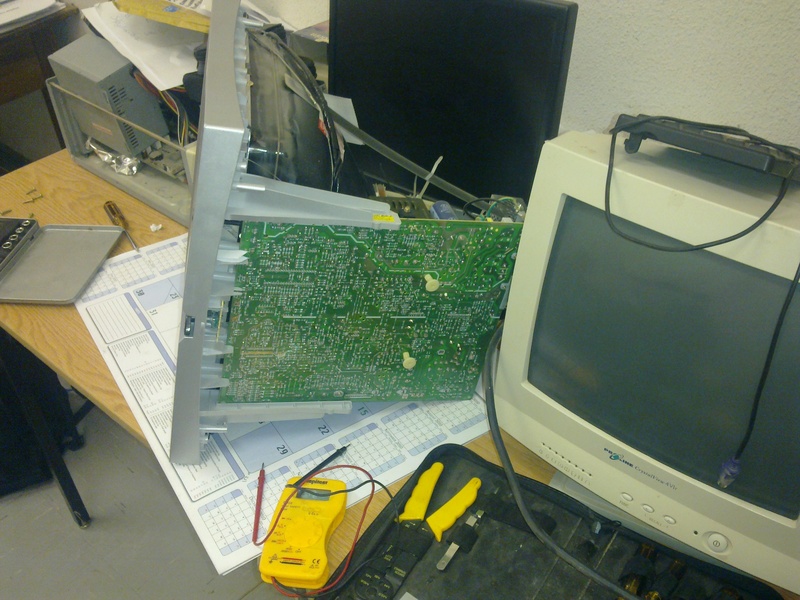 Of all the things we poke screwdrivers into few can kill you quite as quickly and spectacularly as a CRT monitor. The bits inside (technically known as the magic gubbins) uses all sorts of ridiculous high voltages in excess of 10,000 for some components. With lots of lovely capacitors to keep plenty of current handy to earth through your unwitting hand. A full-on mains belt is nothing compared to a CRT discharging through you (and actually the opportunities for mains electrocution are less and less these days as most stuff operates at boring low voltages with a well protected transformer). So I waited the requisite 48 hours and then another 24 for good measure before opening it up. I was sadly unable to find any children to poke around inside just to be certain everything was discharged so I had to hope that was the case and dive in. Luckily I found the switch assembly and missing bit fairly easily. With a bit of caressing into place, superglue on stuff held with pliers and of course masking tape it was good to go. In fact I was so confident in my work I was able to plug it in at Anika‘s office and after failing to convince her to turn it on did so myself. With a stick. From behind a desk (well from under a desk actually). Covering my eyes and praying to Zeus. It worked though, much to my amazement, and is now back in the TB office recording data. After finding the plug in their office had tripped out and playing hunt-the-circuit-breaker that is (eventually found in the operating theatre, obviously). 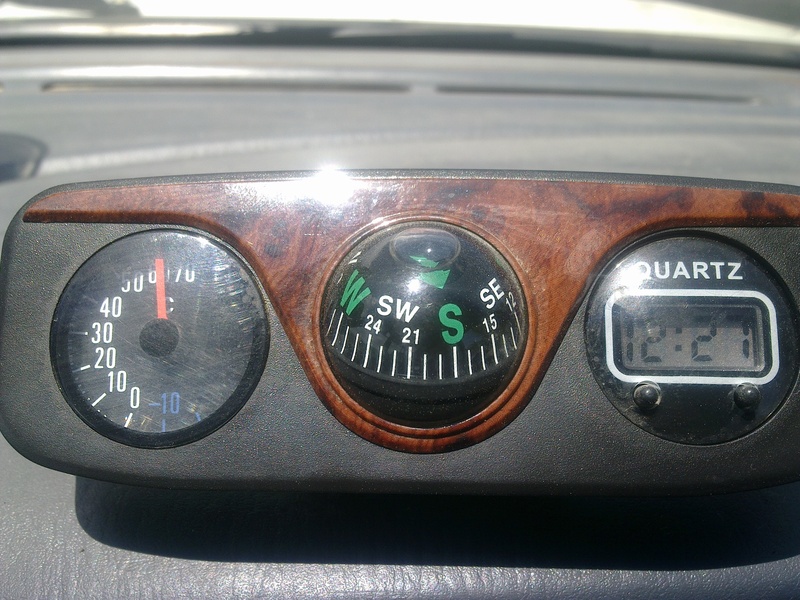 Feeling it was a bit warm the other day I saw the dashboard temperature whatsit reading I think the highest ever. Just like last January I didn’t believe it, touched the dash, swore loudly thanks to the burning and then took a picture. I have yet again been lax on the blogfront but I blame work, slackness, sleep, electricity, my boringness and goats in no particular order. 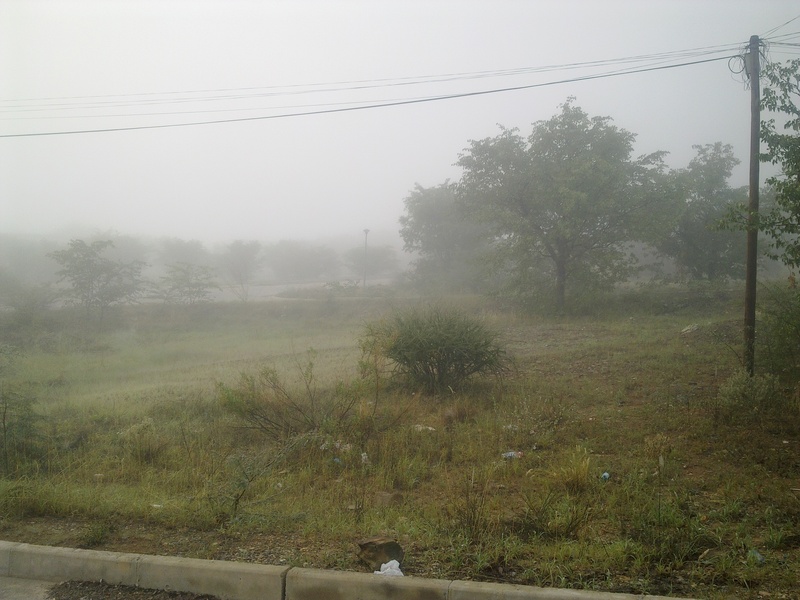 One morning I woke to find Opuwo blanketed by fog. Once again I braced myself for an imminent zombie or alien invasion but alas nothing much happened and the sun soon burned through. Did remind me of home though. 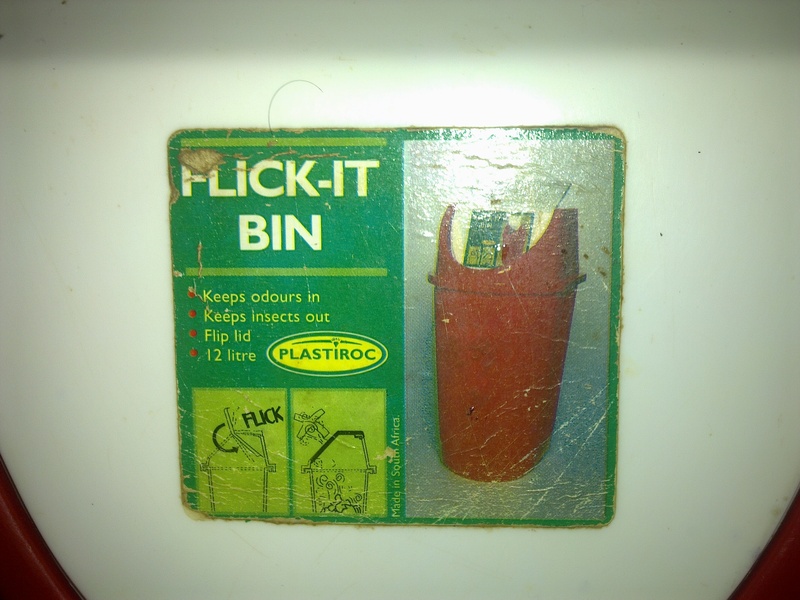 These bins are in the toilets of the Opuwo Coffee Shop (the greatest place on earth). Maybe it’s just me but it scans a bit odd. Yes I sort of have a cat. 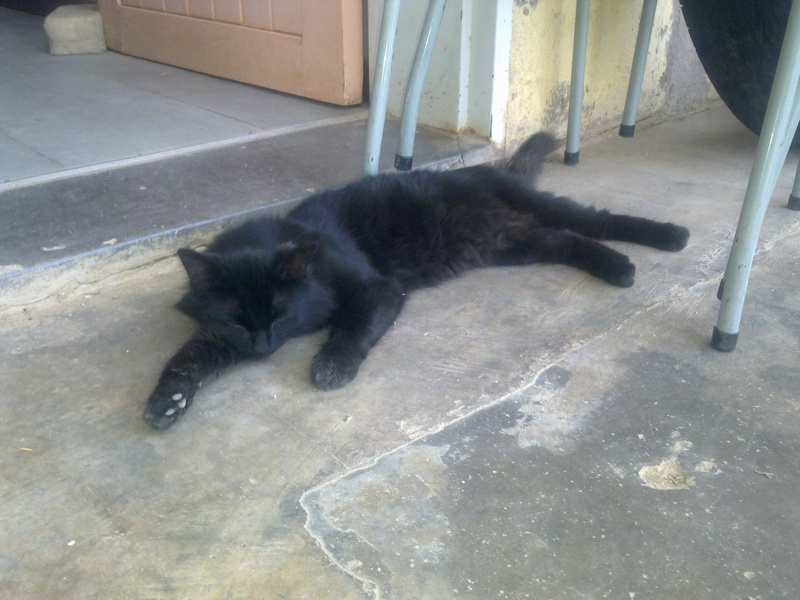 Mr Cat (though she’s actually a she). 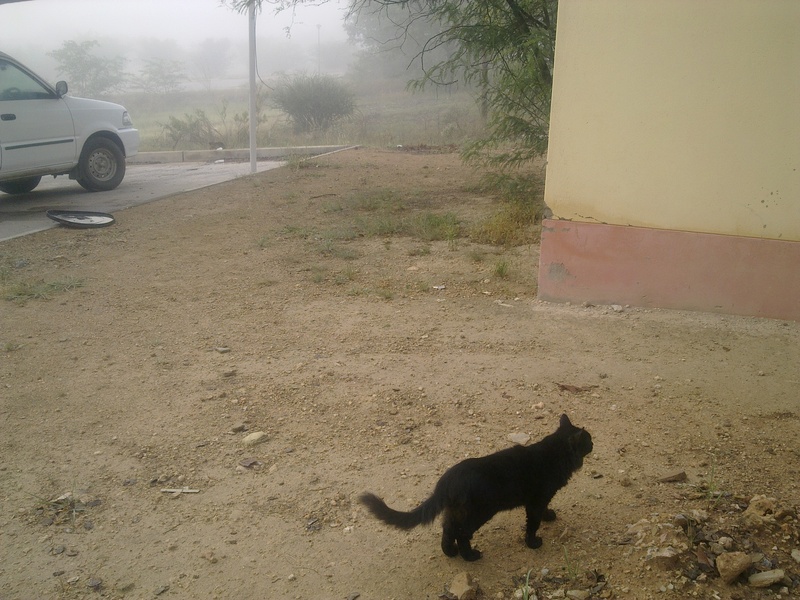 Mr Cat’s official duties include going into the house when I’ve been away to look for scorpions, fighting off camel spiders and generally being an action hero. 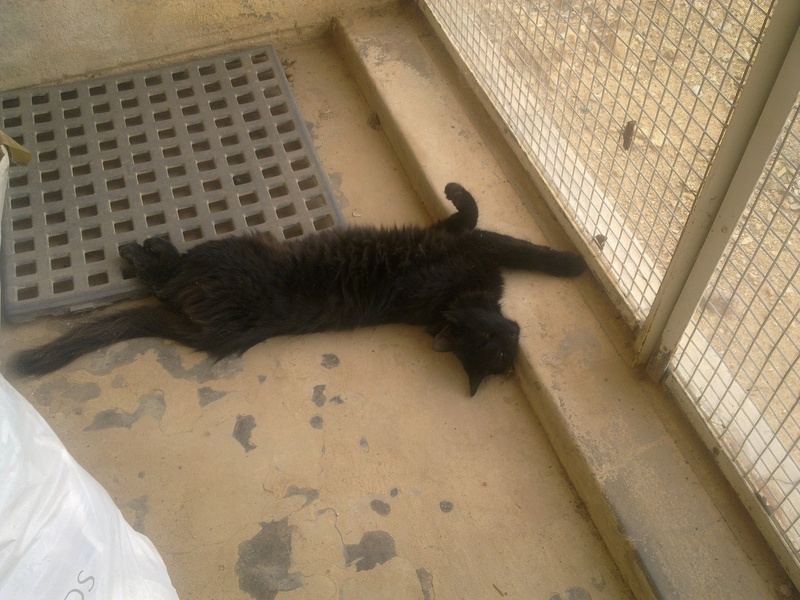 Mr Cat’s actual duties involve sleeping, moaning and running away at critical moments. Mr Cat ready to leap into action. Or not. 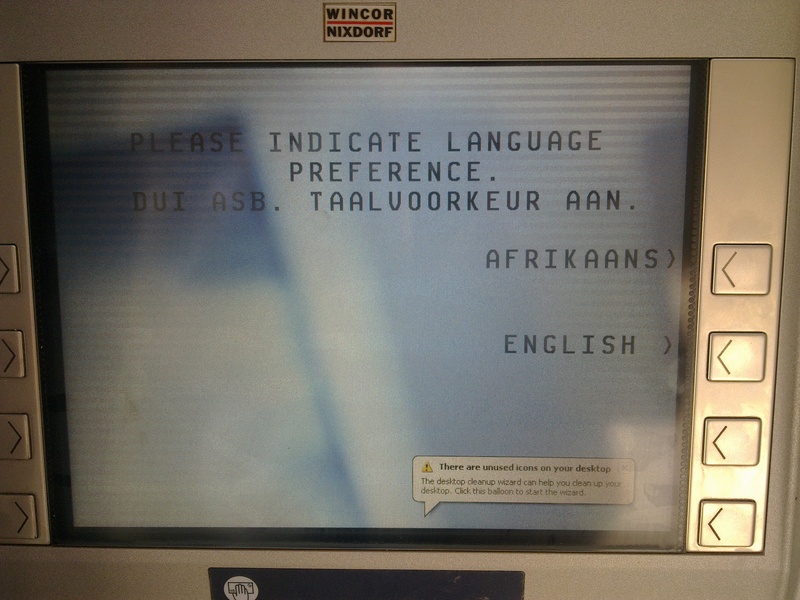 Question: When is it a good idea to run Windows on banking systems such as ATMs? Answer: NEVER. NEVER EVER. NOT EVEN SLIGHTLY. An excellent Opuwo Saturday night. Off to John’s for Poker. Rieme had a firework display which we watched from afar (very impressive even if I didn’t drive down to see it up-close-and-personal as I’d had a drink). Tafel lager is the greatest. Won N$12 (a whopping £1.20 or so) at Poker even after John decided we should play Opuwo-Stud (but we didn’t get to play Opuwaha, my take on Omaha, mainly because nobody could remember the rules convaluted as they were). Home by 4am as nobody seemed around to hit up the shebeens. Posted in Uncategorized | Comments Off on Poker. Fireworks. Drinking. 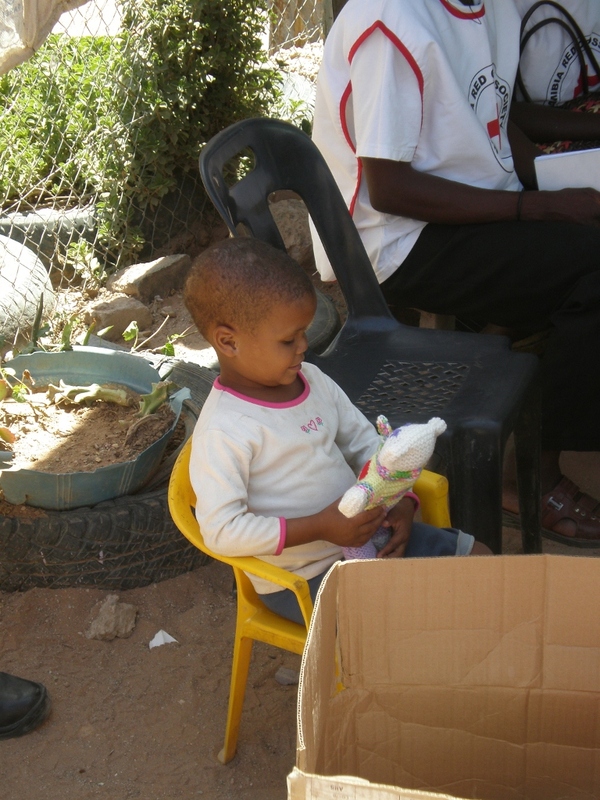 In addition to my dayjob as a rather bad IT Specialist with the Ministry of Health and my nightjob as unofficial Tafel lager taster and Shebeen reviewer I occasionally, usually by accident, end up involved on the periphery of some good works for the Children of Namibia. Here are two examples of the aforementioned good works. The Leonard Cheshire Foundation is an international charity who support people with disabilities. 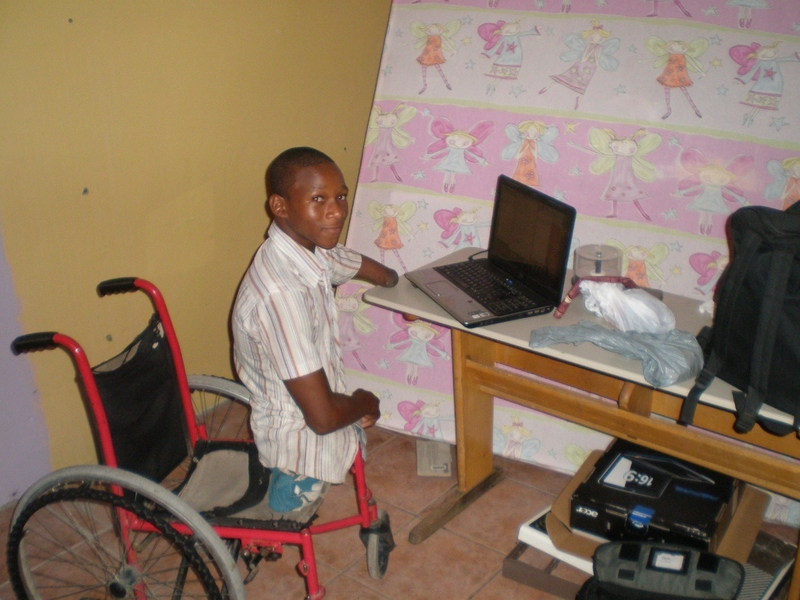 Part of their work focuses on helping children with disabilities to access education. In Namibia they have two Cheshire Homes where children live and are cared for so are able to access schooling that would be otherwise impossible for them to reach. The Katima Mulilo home is run by a dedicated group of Polish nuns and caters to a large number of children with various disabilities as well as providing outreach services to the local community. VSO have a physiotherapist placed in the home who is a good friend of mine and provides rehabilitation services for the children and the surrounding community. Last Easter I was in Katima Mulilo (it’s as far as you can go in Namibia being right at the end of the Caprivi strip after which you fall off into Zambia, Zimbabwe or Botswana). 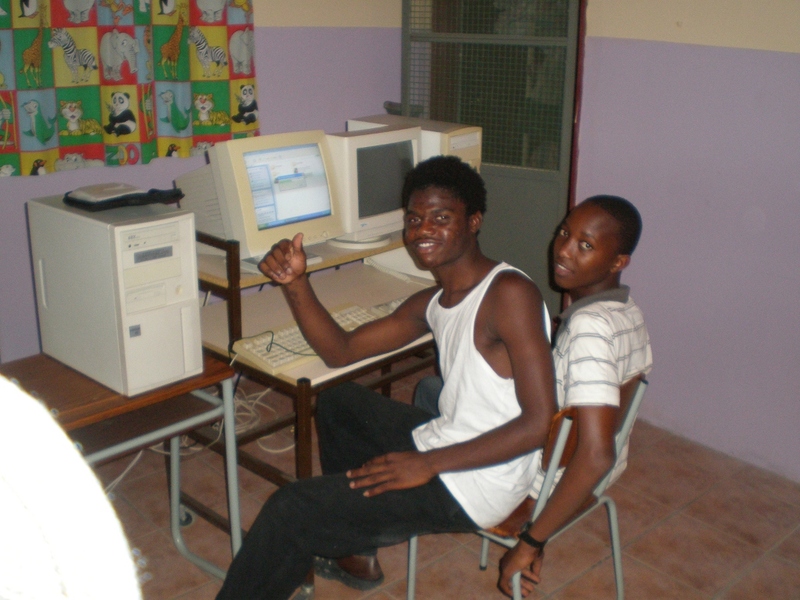 My main work in Katima was with the Ministry of Education (arranged by another VSO volunteer) and I went around prodding computers in school and trying to “share skills” with the local technician. 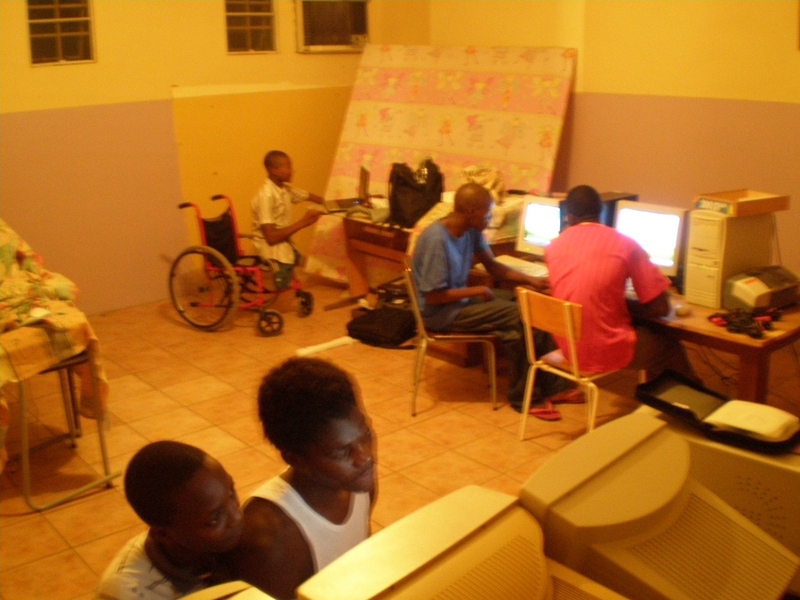 In addition though I spent some time at the Cheshire Home and helped them sort out and setup a computer lab with donated equipment. 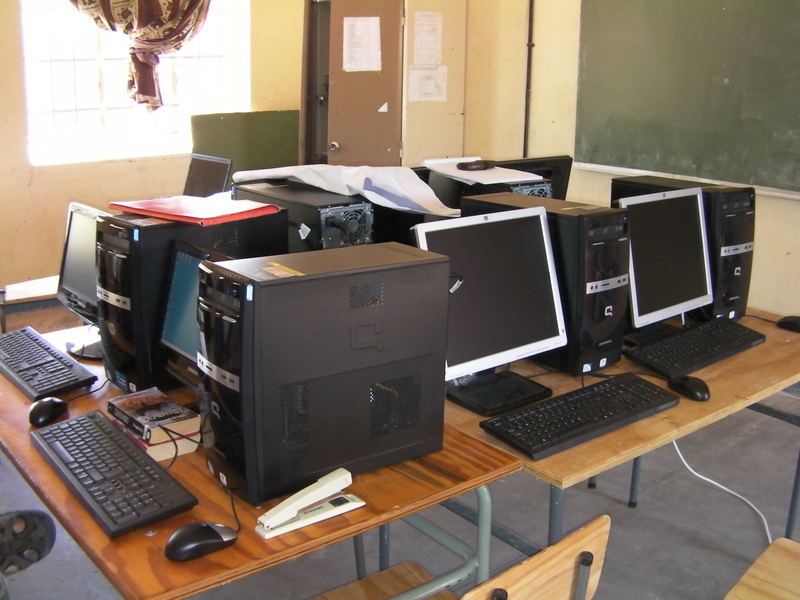 This involved testing it and then (as most of it worked but the operating system was banjacksed) showing some of the older kids how to install Windows and various cool bits of educational software. We then did a few nights of training/playing. Please note of course that I didn’t get the computers (they were already donated), prepare the room (already done), wire the sockets (done by a VSO NVP) or even rearrange the desks myself (done by the kids). I just plugged some stuff in and failed to rewrite an extension cord. 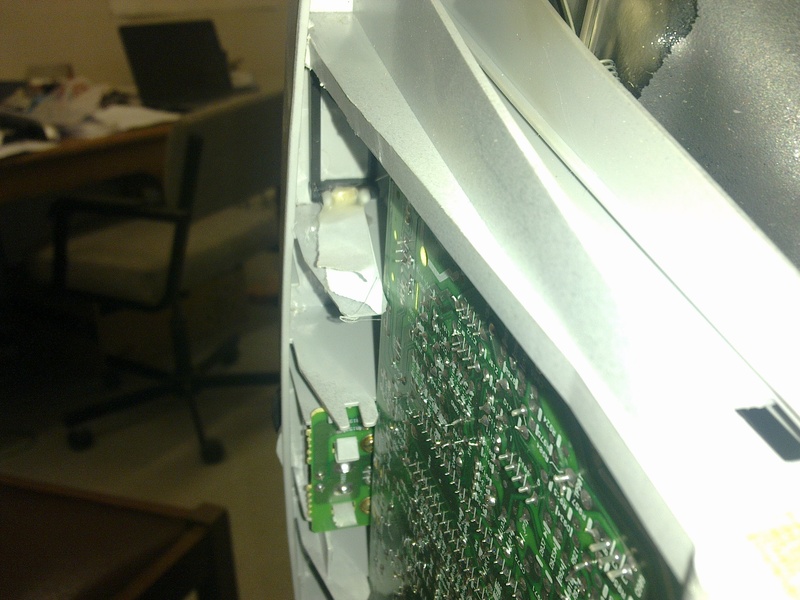 I also did a bit of fault-fixing on the staff computers which led to the bizarre experience of being in a deathly quiet convent trying not to swear at a particularly obstinate printer. The Mother Bear Project is a US charity that aims to “provide comfort and hope to children affected by HIV/AIDS in emerging nations, by giving them a gift of live in the form of a hand-knit or crocheted bear”. The donation of the bears for the Sunrise Orphan and Vulnerable Children (OVC) home in Khorixas was all arranged by my most excellent Peace Corps two-office-down buddy Anika. As I was going to Khorixas to fail to fix some computers I acted as a driver for the trip. The rumour that I only got involved because I thought we were giving away live bears is false and I utterly refute it. Though that would be cool. 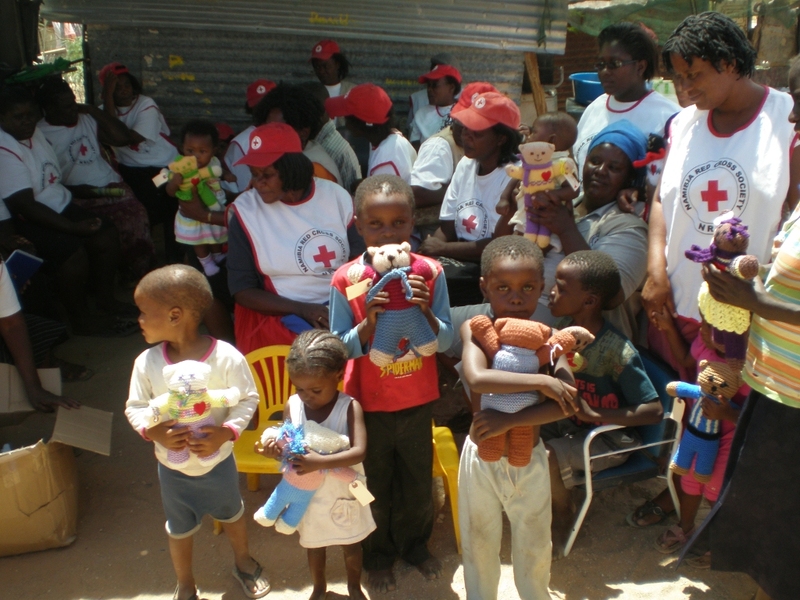 Sunrise is run as a Red Cross project and provides a lovely hostel and food for quite a number of children. The kids were all over the moon with their bears, even the older ones who did their best to play it cool. Anika’s account can be found here on her blog. Once again please note that I had nothing to do with the arrangement of this excellent donation. I just drove there, handed out a few bears, basked in the smiles of the children and then played catch with a few of them while the adults talked serious stuff.